Photo: Bob Hicks, AOE and GrandLuxe Trainmaster, walks away believing he had just given me his last train tour, since the bidding process had closed. As of this writing I do not yet know who purchased the GrandLuxe Express Train. However, I have heard some rumors as to who might have put in a bid for the whole train or some of the cars: Amtrak, VIA, and various tourist and private train owners. When I asked how many bids they received before the closing date, I was told, "Five or six." Before you leave this page to go to any of the following links, please bookmark this page so you can return to it easily. A train with a grand history has found a temporary home in American Canyon, near a hub that once served passengers from Calistoga to Canada. The GrandLuxe Express will remain in American Canyon while it is on the market. GrandLuxe Rail Journeys LLC of Evergreen, Colo. folded in August after running the luxury passenger train for three years. Bob Hicks, the trainmaster, used to travel on the train during its journeys in the United States, Canada and Mexico. A retired train engineer with CSX Transportation, Hicks loves trains. The GrandLuxe Express, once known as the American Orient Express, is no exception. “When it’s running, it’s a beautiful train,” said Hicks, as he walked toward the 20 midnight-blue vintage cars where passengers could relax as they watched the world go by. The train took travelers on scenic trips to places including the Grand Canyon, the Pacific Coast, antebellum mansions of the Deep South, and yes, wineries of the Napa Valley. “It’s like a beached whale sitting here,” said Hicks, 61, as he walked past more humble freight cars at the fenced-off rail yard. 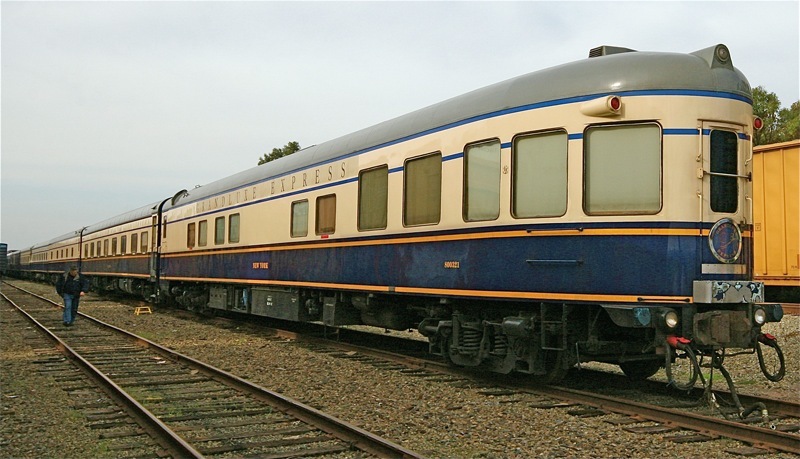 The entire train is for sale: the locomotive as well as 12 sleeper cars, three dining cars, observation and lounge cars dating from the 1940s to the 1960s. The GrandLuxe’s trips came to a halt in late August, when GrandLuxe Rail Journeys ceased operations. “(The company) ran into cash flow difficulties and was unable to continue,” said Thomas Kim, a consultant for GrandLuxe Rail Journeys. The train arrived in American Canyon in October, where the weather is favorable, according to Kim. The company, which employed about 100 people, wants to sell the entire train to the best bidder, he said. New York investment bankers are coordinating the sale, he said. “There is an active process going on right now,” Kim said, though he declined discuss the number of bids he has received. As Hicks walked along the corridors on the train, he pointed to the bar where passengers relaxed while they nibbled on hors d’oeuvres, listened to the baby grand piano or lounged on the observation decks. Up to 145 passengers could eat, sleep and dine on board. Everything was first class, Hicks said proudly, including the buses chartered to transport the passengers to visit the sights along the way. Fares for a week-long trip from Denver to the Bay Area ranged from $4,300 to $7,100 per person. Among those who have seen the train is American Canyon resident Lavern Wilson. Neil Thompson, a Madera-based developer with interests in American Canyon, noticed the train when it first arrived a few weeks ago. A self-described train buff, Thompson said he’s been receiving the American Orient Express and GrandLuxe Express tour brochures for years. “Rats!,” said Thompson, when told the train is dormant. When he first saw the train, he wondered if it was parked there while passengers explored the Napa Valley. But when the train remained week after week, Thompson figured something was up. Christopher Kyte is chairman of Uncommon Journeys, an Oakland-based travel company that sells train tours of the United States and Canada. He said that train travel is appealing to many, and is more relaxing than other modes of transportation. “Who wants to take a bus anywhere for a long time?” he said. But the longer the trip, the less likely people are willing to travel by train, Kyte acknowledged. Very few people will find the idea of taking four days to travel from the Bay Area to Atlanta appealing, he said. Kyte also said the market of possible buyers for the GrandLuxe is limited. While the effort to sell the train continues, Hicks keeps an eye on the GrandLuxe. He said he heads to town when he wants a break from his menu of microwaved pasta. He has stayed on the train but now checks into local hotels for a warm shower and a good night’s sleep. The train’s metal creaks at night when the temperatures cools down. It’s quite scary, he said. Yet Hicks is not complaining about his stay, which could stretch a few more weeks. “Being in Napa is quite a deal,” he said. GrandLuxe Rail Journeys LLC said Wednesday it will sell off the luxury train it operated until last month as GrandLuxe Express. The Evergreen company said it’s retained Libra Securities LLC to sell the train, which includes 20 cars operated as GrandLuxe Express and another 11 cars not currently in service. The train was known as American Orient Express before 2006. The company offered 10 different four- to 12-day trips aboard the GrandLuxe, but shut down operations in late August because of financial concerns. Potential buyers can take a virtual tour of the train cars at luxuryrailcars.com [ This is the website I used at the beginning of this report as was still online at the writing of this report in early December, 2008] or visit the cars in person later this month in Napa Valley, Calif.
“This is a unique opportunity for a sophisticated investor to acquire a train comprised of restored, 1940s and ’50s-era luxury train cars,” Thomas Kim, manager of GrandLuxe Rail Journeys, said in a statement. WASHINGTON - A company that offered luxurious rail tours aboard refurbished vintage cars and was a major charter customer of Amtrak has gone under. GrandLuxe Rail Journeys abruptly ceased operations last week. "We are financially unable to continue operations," the company said in an Aug. 26 note to people booked for upcoming tours. It said it did not know whether people would get their money back. It is unclear what caused the collapse. Phone calls Wednesday to GrandLuxe headquarters in Evergreen, Colo., were greeted by a message saying the mailbox was full. Bob Whitley, president of the U.S. Tour Operators Association, said other luxury tourism companies do not appear to be suffering, despite a soft tourism market overall. "The only area doing really well is the luxury side," he said. "It's less affected by the economy and the weak dollar." GrandLuxe was not an association member. For Amtrak, the closure of GrandLuxe, formerly known as American Orient Express before it came under new ownership in 2006, means the loss of several million dollars in an annual revenue, Amtrak spokesman Cliff Black said. He declined to be more specific. GrandLuxe relied on Amtrak to pull its train on various scenic routes. The national passenger railroad provided locomotives and engine crews for the trips, which lasted seven to 10 days and cost upward of $4,000. Amtrak did not provide onboard staff or marketing for those tours, Black said. Last year, the companies attempted a closer partnership, announcing with much fanfare that GrandLuxe cars--including spacious sleepers, dining rooms and lounge areas--would be attached to certain regularly scheduled Amtrak trains during the holiday season. The idea was to offer a shorter, less expensive option with the same five-course meals and other luxury amenities as GrandLuxe's usual tours. Amtrak helped market the service, dubbed GrandLuxe Limited, through its loyalty program, Guest Rewards. However, the service, originally planned for three routes, was scaled back to just one train, the California Zephyr between Chicago and Emeryville, Calif. The partnership was not renewed this year. Tom Weakley, an 18-time GrandLuxe passenger from Indianapolis, said he was extremely disappointed by the company's closure. He had trips booked for November and March, but has been assured by his credit card company that he'll get his money back. It's unclear what will become of the company's 1940s and 1950s passenger cars and whether another company will try to operate the train. Amtrak is unlikely to be interested, Black said. Whitley said he knew of no other companies offering high-end rail journeys in the U.S. Succeeding with such a service would require skilled marketing, Whitley said. "It's not been extremely popular in the U.S. because it's unknown," he said. "Rail in the U.S. is not like in other parts of the world." Mahogany interiors, five-course meals and personal butler service will be available on several Amtrak routes starting this fall, as the national passenger railroad embarks on a new partnership with GrandLuxe Rail Journeys, formerly known as American Orient Express. The new service, dubbed GrandLuxe Limited, will be available between Chicago and the San Francisco Bay area; Chicago and Los Angeles; and Washington and Miami. Limited trips are also scheduled from Washington to Chicago, Denver to San Francisco, Denver to Chicago and Chicago to Albuquerque. The project marks the first time Amtrak will provide regularly scheduled private rail services. Tickets for the two- and three-day GrandLuxe Limited trips will be priced from $789 to $2,499. In contrast, GrandLuxe's regular tours take seven to 10 days and run about $4,000 to $8,000 per person. For the Amtrak partnership, GrandLuxe will split its train in three. Each segment will have a dining car and a lounge car and have room for 47 passengers, said Christina Messa, vice president of marketing for GrandLuxe. It will operate separately from the Amtrak portion of the train. GrandLuxe passengers will not be able to get off at intermediate stops because of limitations such as platform length, though the companies said that could change. Amtrak will operate the same number of cars it normally would, but in some cases it may have to add an extra locomotive, Amtrak spokesman Cliff Black said. For information and reservations: [Of course this website and phone number is not valid] GrandLuxe, www.grandluxerail.com, (800) 320-4206 or Amtrak Vacations, www.amtrak.com, (800) 872-7245.